CLAIR has technical collaboration agreement with ARGUS FANS Inc., Canada, for all ranges of Industrial Fans. 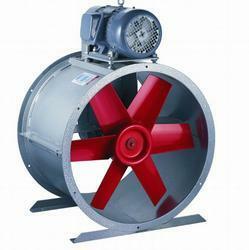 CLAIR-ARGUS centrifugal fans are of sturdy construction covering a very wide range for operation. Various types of impellers and fan arrangement makes the selection versatile. - The impeller has adjustable blades which make it possible to adapt the fan to the requirements of the plant. We are a leader in offering a best quality of Belt Driven Axial Fans to our clients. Our offered range are made using supreme grade material and are extensively appreciated by our clients. Our Belt Driven Axial Fans are made available in different shapes & sizes according to the demand of the clients. We offer precisely made belt driven in various sizes and specifications. We fabricate these Belt Driven from the superior quality base materials available in the market. Our products are made available in different shapes & sizes according to the demand of the clients. 220 Volt Direct Driven Fan 8" X 6 "
Impeller Size: 8" x6 "
We are one of the proficient manufacturers and suppliers of Belt Drive Axial Fan. Axial fans designed & developed by us are ideally suitable for large quantities of air at low pressures. 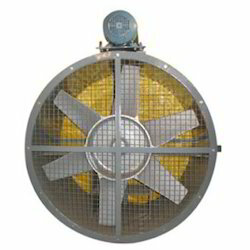 These axial fans produce very little noise making these the most preferred choice of clients.